Today J and I hit the gym around 11 am. I planned on focusing on my strength training since I already ran. 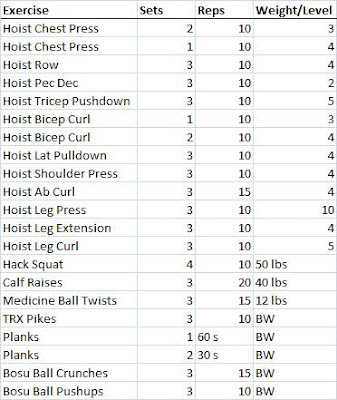 And as my earlier post stated, I was planning on trying out a full body circuit using the Hoist machines. Its trial and error while I start this marathon program. Today I ended up having extra time even after my circuits because J decided he was going to tan while we were there. J has psoriasis, so tanning is VERY good for that. So when we joined this gym together, he added a tanning package to his membership. Here is the workout I did today. I tracked EVERYTHING so I can make sure to work on improving all spring. Yes... a pretty long workout. But I feel good and like I god a handy strength workout in, which helps since yesterdays was a little cut short, I think. I am tired, but not sore, not yet. We'll see how it is later though! Awesome workout! :) Morning workouts are great!